WASHINGTON, DC, December 15, 2011 (ENS) – Four research projects to advance hydrogen storage technologies for fuel cell electric vehicles have beeen chosen for funding by the U.S. Department of Energy. 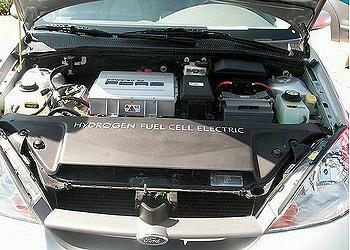 Fuel cells have the potential to replace the internal combustion engine in vehicles. But to replace gasoline as a fuel, hydrogen must be safely and densely stored, yet easily accessed. Limited by materials unable to serve both goals, hydrogen storage technology has lagged behind other clean energy candidates. To overcome these barriers, the agency will distribute more than $7 million to two national laboratories, a university and an independent research lab, which are in turn contributing a total of $2 million to cover project costs. The projects focus on lowering the cost of compressed hydrogen storage systems and developing advanced materials for hydrogen storage that will enable more efficient storage of the gas at lower pressures than current compressed hydrogen tanks. Compressed hydrogen storage provides a near-term pathway to commercialization, and reducing the costs of compressed tank systems will accelerate their market availability and adoption, agency officials said. “Targeted investments in cutting-edge hydrogen storage technologies will spur American ingenuity, accelerate breakthroughs, and increase our competitiveness in the global clean energy economy,” said Energy Secretary Steven Chu. These three-year projects in California, Washington, and Oregon are being funded to help U.S. automakers bring more fuel cell electric vehicles into the mainstream market. “As we focus on energy security, strengthening our portfolio to include domestically-produced hydrogen and American-made fuel cells for transportation and energy storage applications will create new jobs and reduce carbon pollution,” said Chu. Hydrogen is an obvious alternative to hydrocarbon fuels, such as petrol. It has many potential uses, is safe to manufacture, and is environmentally friendly. Pacific Northwest National Laboratory – Richland, Washington – Up to $2.1 million DOE’s Pacific Northwest National Laboratory, in collaboration with Ford Motor Company, Lincoln Composites, Toray Carbon Fibers America, Inc. and AOC Inc., will use a coordinated approach to reduce the costs associated with compressed hydrogen storage systems. The project will focus on improving carbon fiber composite materials and the design and manufacture of hydrogen storage tanks to lower the cost of manufacturing high-pressure hydrogen storage vessels by more than a third relative to current projections. HRL Laboratories, LLC – Malibu, California – Up to $1.2 million HRL Laboratories will investigate an innovative approach to hydrogen storage using engineered liquids that can efficiently absorb and release hydrogen gas. Liquids confined in porous structures have been shown to absorb more gas and could create sites for hydrogen molecules that did not exist in the bulk liquid alone. HRL will use this concept to develop composite materials capable of dissolving up to 50 times greater quantities of hydrogen than in the bulk liquid, with the goal of enabling high density, compact hydrogen storage. Lawrence Berkeley National Laboratory – Berkeley, California – Up to $2.1 million DOE’s Lawrence Berkeley National Laboratory, partnering with the National Institute of Standards and Technology and General Motors, will use a theory-guided approach to synthesize novel materials with high hydrogen adsorption capacities. The team will develop and test “metal-organic framework” materials that have surfaces allowing high density of hydrogen, as well as materials with pores engineered to enable hydrogen storage at near-ambient temperatures. University of Oregon – Eugene, Oregon – Up to $2.0 million The University of Oregon, along with the University of Alabama, DOE’s Pacific Northwest National Laboratory, and Protonex Technology Corporation, will develop and test promising new materials for hydrogen storage. The proposed chemical hydrogen storage materials could enable liquid refueling, and regeneration of the hydrogen storage material, within temperature and pressure ranges suitable for both onboard mobile and stationary fuel cell applications. The Energy Department says innovations achieved through these projects will address technical barriers to storing hydrogen onboard fuel cell electric vehicles. On December 6, the department’s Office of Energy Efficiency and Renewable Energy launched a comprehensive hydrogen storage materials database to collect and disseminate materials data and accelerate advanced materials research and development. As a free access resource for the research and development community, the new database will accelerate the development of advanced hydrogen storage materials by consolidating the technical knowledge-base, including hundreds of material property listings and references, in a single location. On December 13 at 11:00 am EST, the Energy Department is offering a webinar to demonstrate the functionality of the database covering topics such as accessing and extracting data, submitting new material property data for inclusion, and performing organized searches. The real-time walkthrough of the database will provide an opportunity for user questions and feedback.